Philadelphia Eagles quarterback Carson Wentz. Every week of the NFL season, we offer up five numbers to keep an eye on when the Eagles take the field. This week, with the return of Carson Wentz against the Colts, we've decided to make it very quarterback-heavy edition of over/unders. Sure, this one isn't entirely about Carson Wentz, but he will play a major role in this final number — plus we include the final score every week. The 46.5 you see above is the current offering over at Bovada, and based on my prediction from this week — a 33-20 win for the Birds — I'm pretty much locked on the over. As you'll see throughout this post, there's good reason for that, especially on one side of the ball. 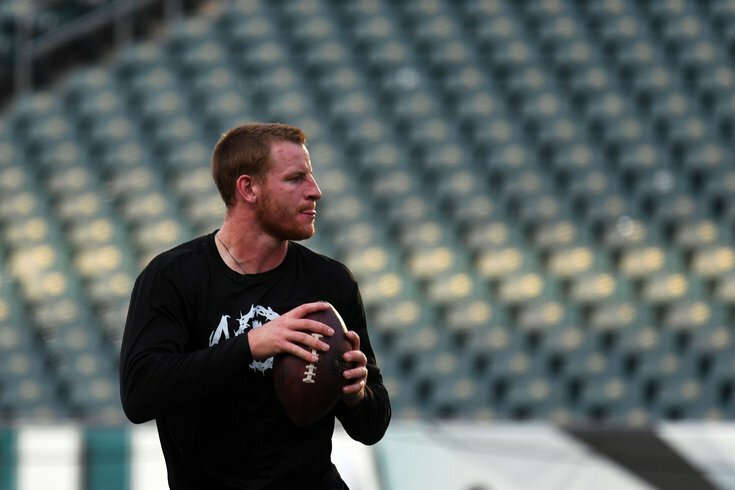 Wentz looked great in practice this summer, and while that's not the same thing as playing in a game, there's nothing in the young quarterback's past to suggest that he'll struggle in this one. Perhaps the biggest worry will be over the players tasked with catching Wentz's passes — three of his top four receiving targets are injured — and taking his handoffs —Jay Ajayi and Darren Sproles are already ruled out, while Corey Clement is questionable but expected to play. All of those signs point to the under in this. But then you remember the guy who was on track to be MVP last season before his injury is returning to the field. That's exactly what Wentz averaged last season in his 13 games. And before you sarcastically say, "But, Matt, you just said you were expecting a big day from Carson..." let's remember that Wentz didn't get off to the hottest of starts last season. In fact, he didn't throw more than two touchdown passes in any of his first four games last season. However, I still think he comes up just short of this one. Last year, Wentz averaged 23 yards rushing per game. It seems like only a matter of time before Wentz rolls out on a throw — expect to see quite a bit of that on Sunday — and sees some green space in front of him. Not only do I think he hits the over here, but I think he does it on one run. Why the very specific number of 101.9? Well, it's simple; that was Wentz's passer rating from a year ago, when he threw for 33 touchdowns and just seven interceptions. Interestingly enough, however, he only would've hit the over in five of 13 games last year, and none of his first four. Sure, it took a healthy Wentz over a month to hit triple digits last year, but I'm still taking the over here. This guy's really that good. And remember, even if he doesn't hit the over here, it's hardly cause for panic.